Colorado Hemp Oil With Nano ( Fast ) Delivery System! 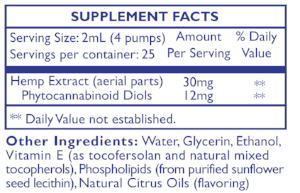 Quicksilver Scientific's Colorado Hemp Oil delivers a nanoemulsified oil that is 40% CBD. The nanoemulsified format improves bioavailability, delivering biologically active substances directly to lymphatic circulation and improving cellular. Quicksilver’s Delivery Systems™ Phospholipid Encapsulation System brings the power of intravenous therapy into a convenient oral delivery. * Our Quicksilver Delivery Systems™ improves upon liposomal technology with smaller, more stable, single-layer spheres made from the highest-grade ingredients available. General Suggested Usage:Take 2-10 pumps by mouth, holding for 30 seconds before swallowing. Repeat as needed. Best taken on an empty stomach at least 10 minutes before meals. May also be stirred into small amount of water. Use within 60 days of opening. Store at room temperature. 10, 2018 Latest & Most Read Colorado Hemp Oil & NanoEmulsified Balance Your Body and Brain with NanoEmulsified Colorado Hemp Oil Of all the healing botanicals that adorn our planet, few offer the astonishing phytochemical bounty of cannabis. This flowering plant contains a cornucopia of 400 unique chemicals, with approximately 70 non-psychogenic but potent bioactive cannabinoids. 1,2 Documented evidence exists tracing human use of the healing and balancing power of cannabis to as long ago as 500 BC, in Xinjiang, China.3Chinese legend tells of the emperor Shen Nung (circa 2700 B.C) recommending cannabis for over a hundred different ailments in his pharmacopeia. And no wonder we gravitated to this plant so long ago—for cannabinoids are a fundamental communication system built into life—present in all plants and animals. Cannabinoids are critical for bioregulation and homeostasis throughout our body and brain. So, if you’re looking for balance, consider the bioactive gifts in cannabis. Hemp is being grown, with federal approval, in Kentucky, Minnesota and other states, and many industries have recognized and are profiting from it as a crop with a broad array of uses. This has opened up our access to the healing cannabinoids from hemp oil as well. In some, they may have a positive impact on sleep as well, according to a 2017 review of scientific research, which found that cannabadiols may help improve disturbances in REM sleep leading to excessive daytime sleepiness. In sum, nature in her infinite creativity, has gifted us with a flowering plant perfectly calibrated to our own endogenous, innate regulatory cannabinoid system. We might think of it as a great harmonizer, helping us to regain equilibrium and balance.